School choices can be a touchy subject among women. The Christ-follower is to do all things in faith, and of course, how one educates her children is included in "all". If one homeschools, she should do it diligently in faith. If one sends her children to school, she should prepare and send them in faith. Whichever we do, we are to do it all unto the glory of God--not being defined by our own prowess or circumstances, but by relying on the One who is able to uphold our children. This post is a word of encouragement to the mom who is sending her kids off to school this year, but I hope we are all spurred on to "be all here" in the rearing of our children. Adrienne, a godly mom from church who sends her kids to school, shared a math problem with me last year. She estimated how much actual time her kids were away vs. how much time they were at home. She was figuring for her younger children. As we talked I was encouraged, realizing how much time we actually have with our children and how it is far greater than the time they will spend at school. Her calculations are below. Your particulars may vary. Are you surprised by how the hours stack up? I was. 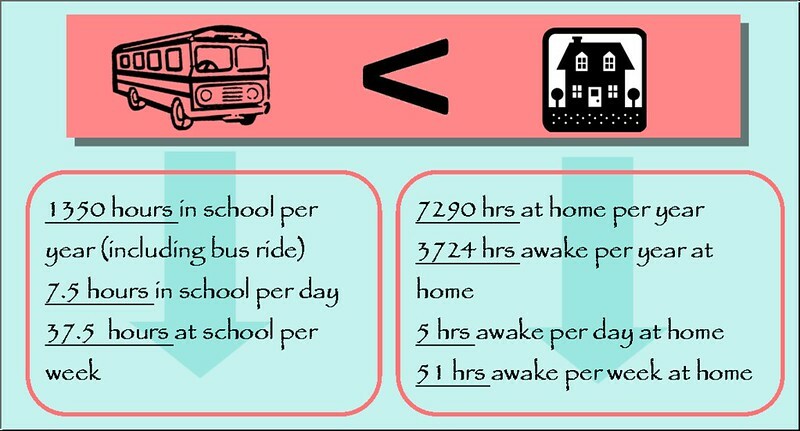 For many, these numbers may articulate exactly why they homeschool: those are too many hours to give away. But for those who do otherwise, be encouraged! Though kids may be absent from home a good part of the day, with the many hours our kids are with us, we have the opportunity to influence their lives for Christ, train, love, encourage, and pray for them. But it takes intention and diligence, doesn't it? Extracurriculars and workload come into play more as children grow older, but still hedging times with our kids and family is worth it. Am I finding ways to intentionally pour the truth of God's word into our children? Are the activities we choose pointing them to Christ or away from Christ? Am I praying over them and for the time we have with them? Am I doing my best each day with the plans we have settled on? Am I committing this work to God? Am I shining the light of the gospel in our current circumstances? How can I set a tone of peace and joy in our home when they are home? Am I engaged and monitoring the condition of my flock: body, mind,and soul? All are questions I hope to remember as another year begins. May the year ahead be full of God's great provision for all of us--no matter how we school--and may our reliance be on Him, through faith in our great God!